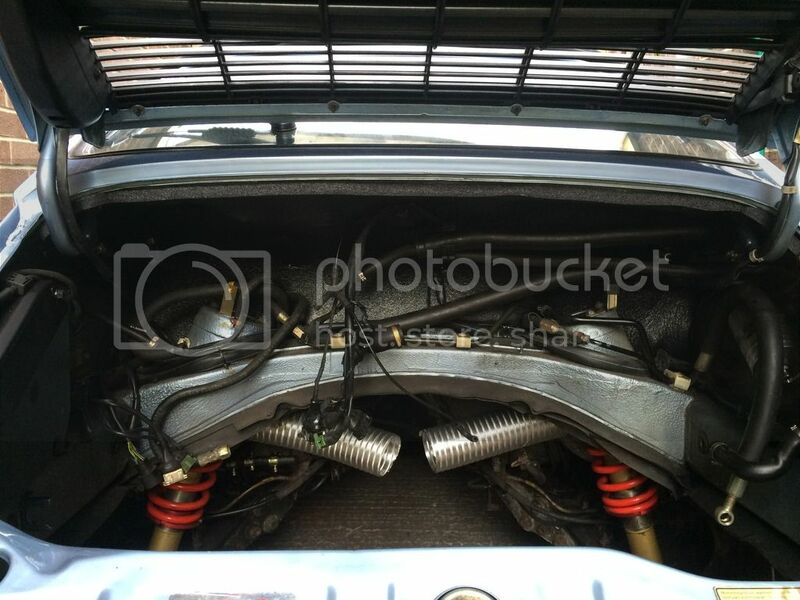 911uk.com - Porsche Forum : View topic - 964 Project - When one thing leads to another! 911uk.com Forum Index > 964 (1989 - 1993) > 964 Project - When one thing leads to another! Chief, when the cars on the pit or on the ramp everything's super easy! Hi chaps, a little bit done over the last couple of days but nothing to get excited about! I've wax oiled all the parts you can't get to with the engine and box fitted, it's good to know it all protected. I decided the rear anti roll bar was looking a bit tatty with corrosion at the ends so I decided to give it some love. I stripped it back to clean metal with a flapper disc in the grinder. Then I etch primed it and started to spray it with smooth gloss black hammarite. All done with 5 coats. I'll see how hard wearing the finish is but it looks brand new! 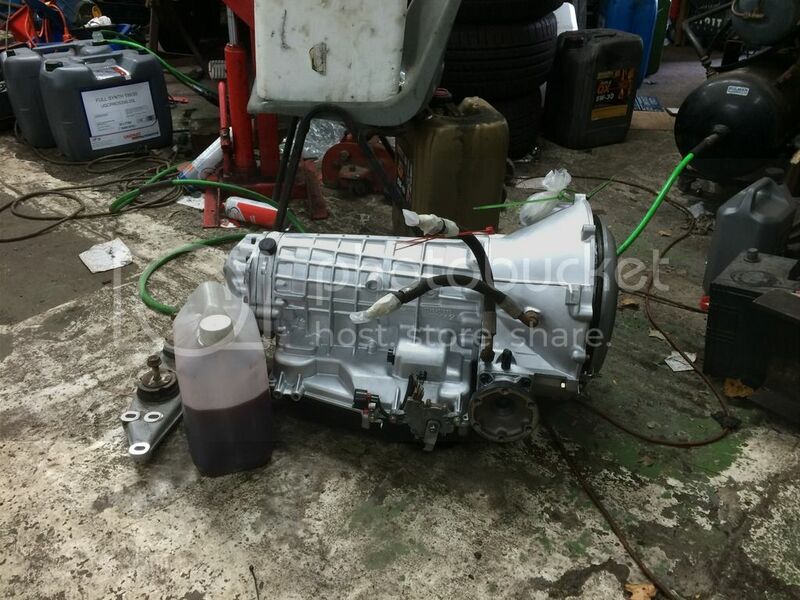 As for the box, when it lost it's ATF it's pulled the seal out of the pump due to low pressure and burnt out the clutches, the box is made by ZF and everything will be replaced using original ZF clutches and seals. Nice work! The only problem with Hammerite is that it's very hard and therefore susceptible to possible stone chips. Stick with it Ian, we all have wobbles every now and then. Mine has nearly gone a few times as it's barely used at the moment. I need to get cracking to catch up with you guys. Hopefully we can have a run out befor the roads get covered in salt! Me neither ha! I'm doing ok ta, but I'm miffed about my front sunroof seal which I wish I hadn't bothered doing, when it didn't really need touching. It seemed like a good thing to do at the time. I still have some spare wheel nuts for you when I see you next, Fishburn on 3rd October maybe? Hi chaps, right, my gearbox repair was supposed to take 5 days but it's now taken 3 weeks unfortunately it's going to take another week so I should have it back by next weekend. A snapped sump bolt has been repaired and the engineer working on the box is replacing everything front to back with new components. The box will be as new so it will be interesting to see how she drives? They are sticking by there quote for the work thank god, so hopefully I'll be refitting the box next weekend. Shame you can't make it next Saturday but there will be plenty of events in the future. In anticipation of getting my long awaited gear box back I fitted the new insulation pad to the engine bay on Sunday, it was a bit tricky even with the engine out so god knows how people do it with the engine in? Hooray, picked the newly refurbished box up today! Refurbished case with gaskets, refurbished torque converter and all internals checked and replaced as needed and all seals replaced including the pump. It'll be interesting to see if there's any difference in performance? Another step in the right direction Ian. Good luck with the installation. It is a great feeling when all the crappy bits that came off go back all shiny and properly bolted together. Amazing dedication and effort. I've got the ATF cooler pipes mixed up! The two pipes fix onto the fittings at the gear box, anyone know which way they go? Or if it matters Which way the ATF goes through the cooler?